Casing pipe crack direction for the horizontal, crack propagation along the circumference, the circumference of about 460mm. The flow can flow from the outer wall of the casing along the middle of the crack into the <24415mm casing, indicating that part of the crack has penetrated the casing wall thickness. Furnace refining → continuous casting → ring furnace heating → perforation → rolling → stepping furnace → sizing → sawing → quenching and tempering → straightening → physical and chemical testing → inspection → thread processing → coupling machine tight → water pressure test → Measuring length weighing, marking → packaging storage. Wherein the continuous casting billet is fed into the annular furnace for about 2.5 hours and then perforated at about 1250 °C, followed by continuous rolling at a sizing temperature of 950 °C and a finish rolling temperature of 900 ° C. The chemical composition of the tube can be used to determine the chemical composition of the tube is not the cause of the formation of cracks. From the metallographic and energy spectrum analysis results can be seen, the crack tip and the middle contains iron oxide inclusions, cracks are non-quenching cracks, should be generated before the heat treatment, is likely to be in the steel pipe perforation, hot rolling process generated. Steel pipe in the perforation process, due to the temperature of the non-uniformity and uneven deformation of the larger additional stress, so that the billet in the perforation process prone to crack; and heating temperature is too high, but also because of reduced intergranular binding force and crack; if the heating temperature is too low, due to reduced plasticity, deformation resistance increases the deterioration of the perforation of the bite conditions, will produce cracks. In addition, during the perforation process, the surface layer will produce longitudinal shear stress and transverse shear stress due to the presence of additional deformation. Therefore, there is a large lateral and longitudinal additional stress in the outer surface of the steel pipe, and when the heating of the tube is not uniform, when the lateral basic stress and the additional tensile stress overlap more than the intergranular binding force, small cracks, these cracks in the subsequent rolling and sizing process, along the rolling direction is elongated and extended to form the final crack. Therefore, in the future production should pay special attention to the perforation temperature, sizing temperature and finishing temperature monitoring and control, as far as possible the temperature fluctuation range of control within ± 20 ℃, and should increase the inspection of the end of the tube strength,if necessary, increase the length of the tube sawing. 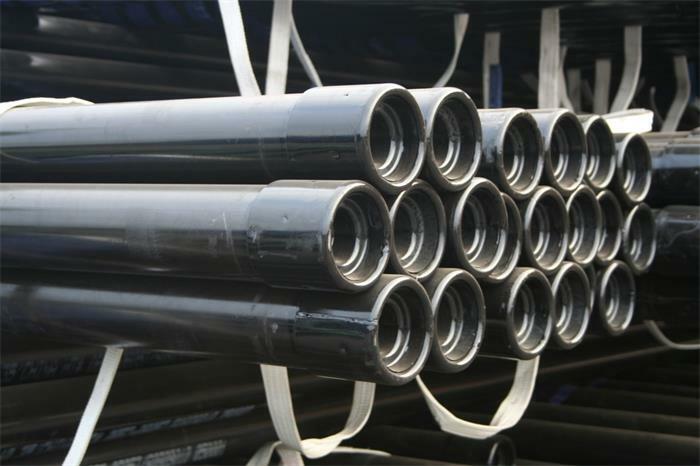 Casing pipe end cracks are generated during the perforation and rolling of the steel pipe. When the billet is perforated, the heating temperature is not uniform and the cracks are formed and expanded in the transverse and longitudinal additional stresses. It is suggested to adjust the process parameters of tube piercing and hot rolling in time to strengthen the control of the heating temperature of the tube, so that the heating temperature of the tube is fluctuating within a reasonable range.